Following the recent completion of the four-year Payroll Shared Services Project undertaken by the National Shared Services Office (NSSO), the wider shared services model is set to expand with the establishment of a new Finance Shared Services operation. Ciarán Galway visits the NSSO to speak with Chief Executive Hilary Murphy-Fagan. Subsequently, legislation was progressed and there is now an organisational distinction between the NSSO and DPER which provides everyone, including the Department, with clear accountability for the delivery of shared services. Murphy-Fagan identifies the service ethos and culture around delivery, quality, innovation and digitalisation as being “at the heart of what we’re about: to serve the civil service and support government in that regard”. As such, it is different when compared with the ethos, pace and focus of the policy department. Now the NSSO is pursuing the establishment of a finance shared services operation intended to transform Government financial management. Currently, financial management is carried out on 31 different financial management systems. When finance shared services is established, the NSSO will manage in excess of €30 billion of expenditure for 48 public service bodies on one single technology platform. “We will be starting with the first wave of departments later on this year, providing transactional processing and accounting services to those departments. 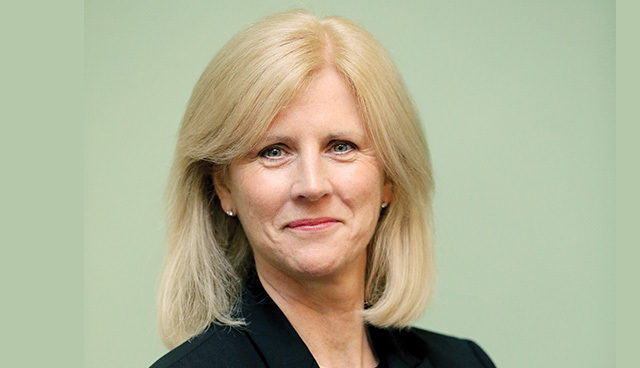 It will probably take three years for all of the departments in scope to transition their finance activities into the finance shared services organisation,” Murphy-Fagan explains. “Ultimately what we’re trying to achieve is to have consolidated accounting for government on a single finance technology platform, where all financial data is structured, captured and mapped in exactly the same way. This will enable each Department to look across their expenditure buckets and see the efficiency and effectiveness of how financial resources get deployed. Currently, data consolidation is a highly manual process so the change is a hugely important benefit that finance shared services can bring. “A very significant component of what we’re trying to achieve concerns business data intelligence and getting insights from all the data which now sits on a single technology platform. 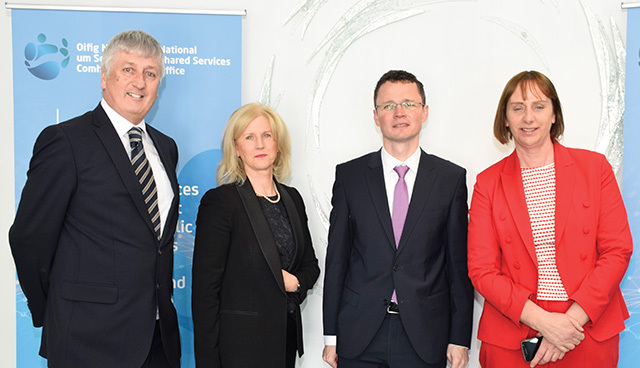 (From L-R) Matt O’Neil, NSSO; Hilary Murphy-Fagan, NSSO; Minister of State Patrick O’Donovan; and Paula Lyons, NSSO attend the recent Payroll Shared Services celebration in Tullamore. Murphy-Fagan regards her office’s role as having embarked upon “a never-ending journey of change and constant improvement”. The journey is still in its initial stages with Phase One set to be completed when finance is established. “Our vision for the Office is to have a single digital platform which runs all of the services for us, while we’re building the analytical and data capabilities of the staff working in the NSSO. The NSSO Chief Executive emphasises her pride in the Office’s staff and their commitment and dedication. “It has taken a huge effort on behalf of some really committed people. It’s quite humbling to see the level of effort which has combined across our four operation locations. “Fundamentally, I want us to be the very best that we can be at this and, while we’re certainly not there yet, that’s our level of ambition,” she concludes.